There was a time in my life when I merrily sent off holiday cheer on pen and paper of my own creation. This was before the World Wide Web and way before any little bears came into the picture. While I appreciated my time crafting, writing, stuffing, stamping and even dropping off holiday greetings at the post, I have not lost hope in any future festive cards that I may create. Thank you to all that continue the tradition especially when we are so hard to pursue given our track record. Some of you may recognize this one sent off well over a couple of decades ago describing December. December the harmful month. I close my eyes and it avails. I even had an aunt from over the pond who would respond back to me regarding my scribe. It would put a smile on my face to know that someone cared to read, think about my ideas and respond. May your nest be filled with cheer and peace onto us all. I am happy to share this recipe, which is a brand new hit in our nest. It’s a twist on kourambiedes, dry and crumbly yet pleasing morsels that appeared at all festive occasions. I do prefer them with cardamom and cashews as Padma Lakshmi from Top Chef suggests of her clouds, instead of the almond and brandy ones. Enjoy, either way the cookies require little effort and are not overly sweet, what more can you ask for during these wielding times? Preheat oven to 325 degrees. Combine powdered sugar and flour in a medium bowl; mix in butter until mixture resembles coarse meal. 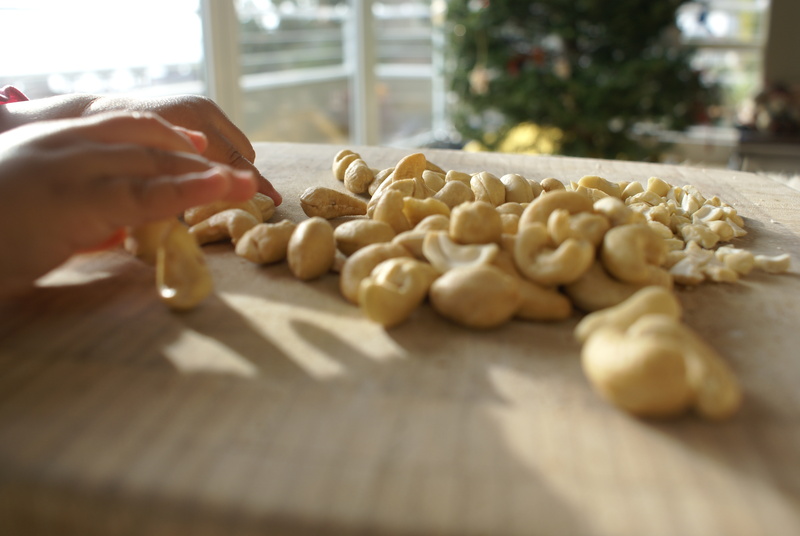 Using a fork, mix in the chopped cashews, vanilla, cardamom powder and salt. Mixture will be very loose and crumbly. Let stand for 30 minutes, covered at room temperature. Squeeze dough together to form small balls about 1 inch diameter and place them on a greased cookie sheet. 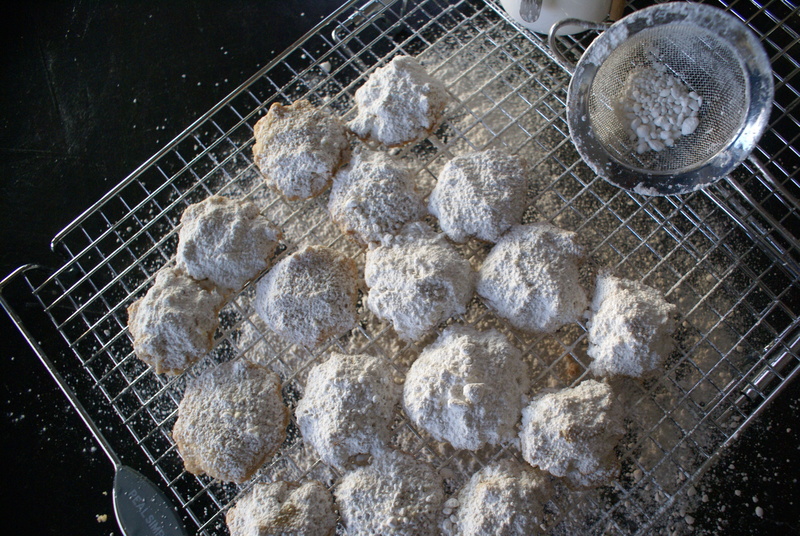 Lightly flour the palm of your hand and smash the balls to 1/3 inch thickness so they resemble irregular clouds. Bake for 22-25 minutes. 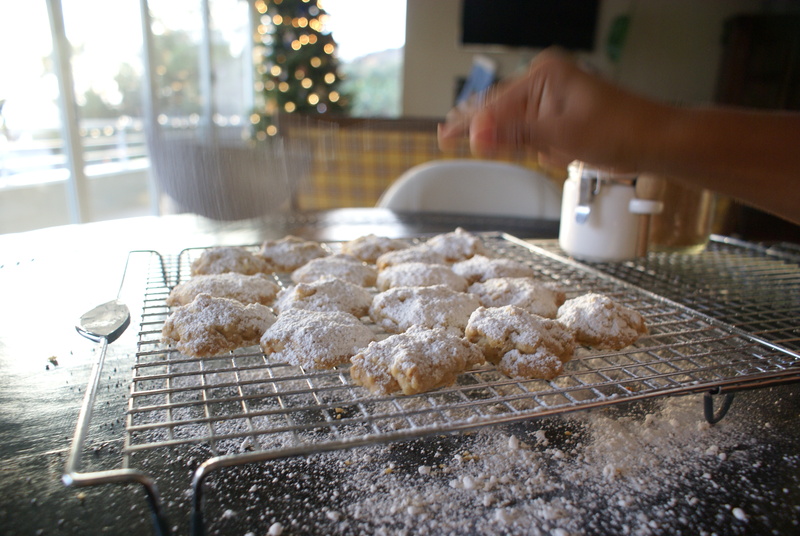 Remove from the oven and dust generously with powdered sugar. Growing up with a Greek grandmother, yiayia, filled my life with vitality and mindfulness. When I think of my yiayia, I remember her traditional rituals, her stories of the old country, her ethnic foods, her icons and embroideries and her singing and dancing. Although words are not colorful enough to come close to describing my yiayia, peculiar is the word that most people label her with—a peculiar old woman with the energy of an adolescent. I remember hearing one neighbor ask my mother if she ever rests. My yiayia wakes up with the sun and keeps the sparrows company in the garden. She roams the neighborhood in search for human connection, a conversation. She loves to speak even if she does not know the language of the listener. She insists on communication, integrating the handful of English words she knows or the few Spanish ones she quickly picks up from Mrs. Hernandez, our next door neighbor. Helping my yiayia in the kitchen preparing for the holidays was fun, especially when it came to kourambiedes. As she prepared the basic ingredients, her life and vitality poured out of her through her zestful stories. I listened and watched her spontaneous gestures with wide open eyes. Our small oven could handle two trays at a time. My yiayia had children, grandchildren, the neighborhood families and her church friends to distribute the cookies to for the holidays. The timer rang and yiayia replaced two more trays in place of the ones she removed. This continued until our kitchen table and our dining room table were covered with aluminum bins of cookies. Although we dedicated the whole day to the cookies, my yiayia entertained me with her storytelling, her singing and dancing. As she sang melodies of the old country, she sprang to her feet and started to dance, stretching her arms out to the heavens. Her sweet warm voice filled the house with joy as she circled around the kitchen. I grabbed her hand and mimicked her steps and flowing arm movements. 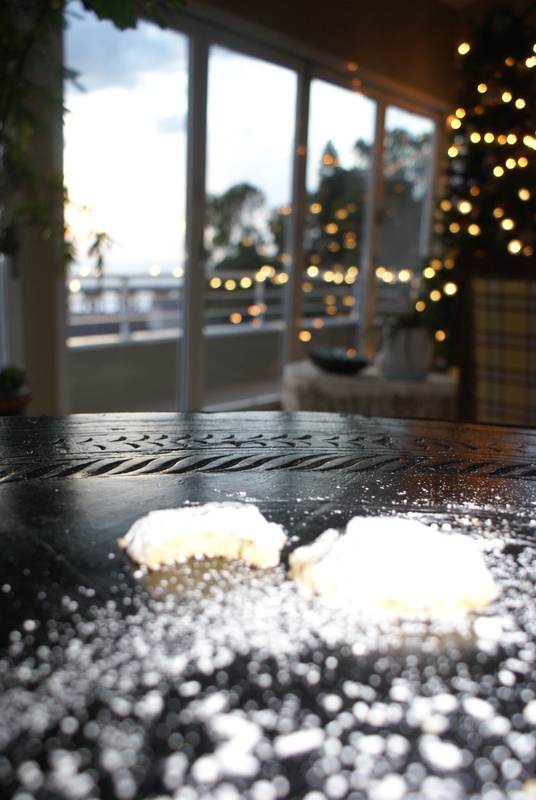 When the last batch finished still-warm-from-the-oven, my yiayia let me layer them with powdered sugar. It was a messy job and as a five-year-old, I managed to layer not only the cookies but most of the kitchen and my apron with the sugar. Although my yaiyia did not care because she had her favorite little listener by her side. 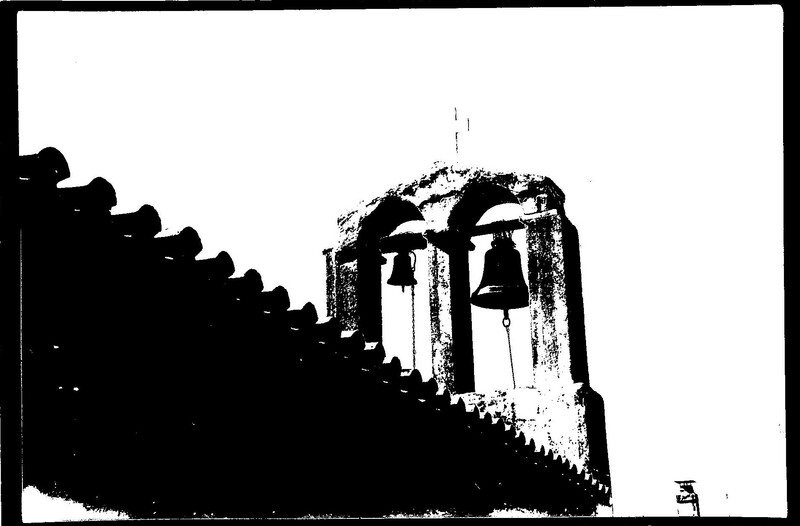 Every night before I went to bed, my yiayia taught me to pray. Her presence next to me instilled a sense of comfort. She bent over to kiss me and I took a whiff of the baked cookies from her silver locks of hair. 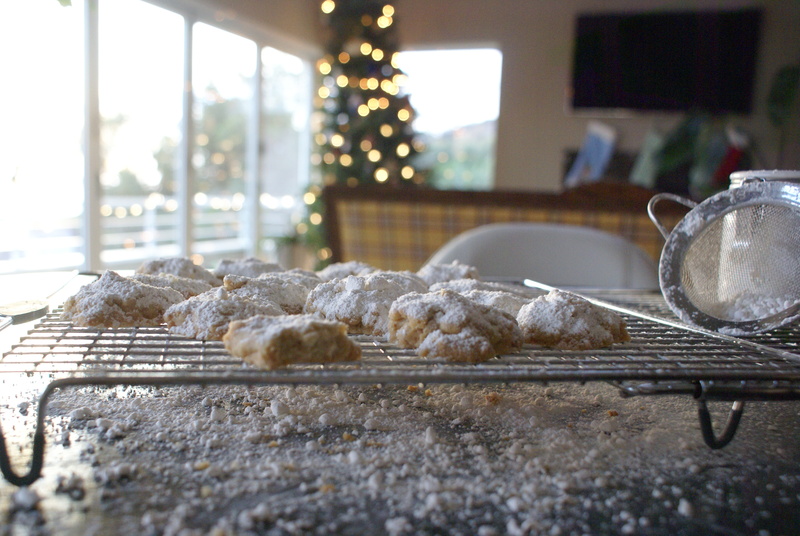 The sweet smell of the fresh baked cookies permeated my bedroom and the stories and songs of my yiayia ran through my head sweeping away the scary uncertainties of the night. I prayed that I would wake up and hear more stories and songs from my yiayia tomorrow. Melt butter in saucepan and sauté almonds and walnuts for a few minutes on low heat. Meanwhile preheat oven to 350 degrees. Grease trays with butter. In a large bowl beat the butter with mixer. Beat in all other ingredients. Form the batter into round and slightly flattened cookies and place on trays. Bake for 20 minutes. Layout wax paper and cover liberally with powdered sugar. 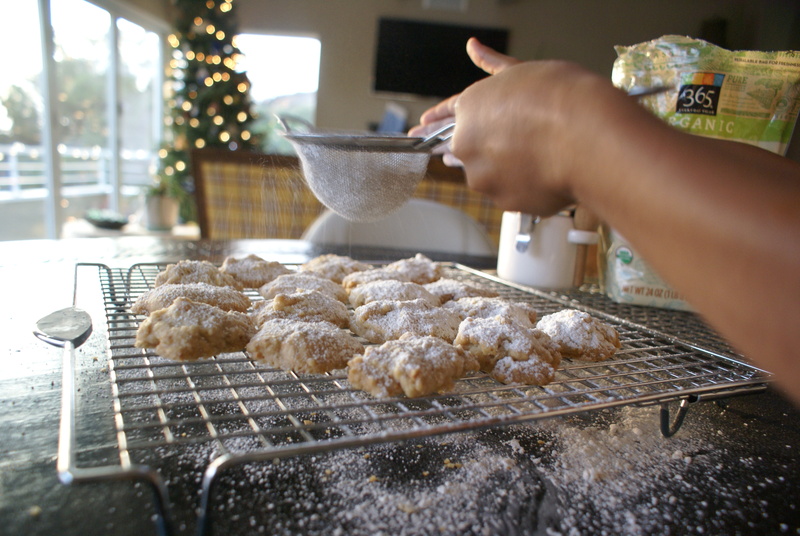 Place warm-from-the-oven-cookies immediately on the blanket of sugar and with a sifter apply powdered sugar on the rest of the cookies. This way the sugar sticks to the cookies. Enjoy the magic of baking with loved ones in your nest! I did a lot of baking in December, Cristina, and shared with neighbors, friends and family. I did so much more baking than in past years and really enjoyed the rhythms of getting home from work and going right to “work” in the kitchen. Of course this is also part of the reason I haven’t had time on-line, but I found myself also thinking about my Scottish grandmother and the hours she’d spend in the kitchen teaching me to bake shortbread from her mother’s recipe. Thank you for sharing about your yiayia. These baking traditions are so often tied directly to our grandmothers and I feel that closeness this time of year myself. How lovely to have memories of baking with your grandmother. And your cashew clouds sound delicious – the festive season may have passed but I will still be giving these a go. Yes her energy was incredible in the kitchen, in the garden or on the playground! Do give them a try, they are incredible simple and so yummy. Enjoy! I will – soon. Can’t wait – I love cashews anyway so think I will love them. Great enjoy…I am sure your sous chef will have fun assisting with the powdered sugar. Both of those Christmas goodies look wonderful. 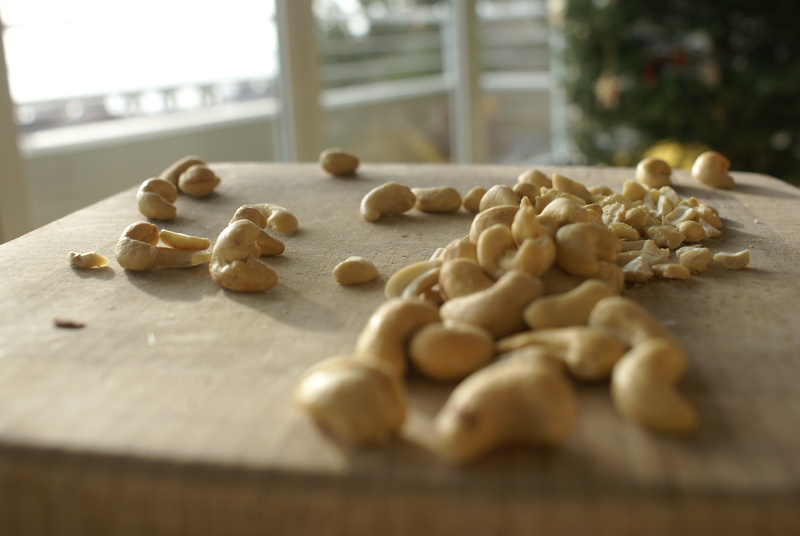 Cashews and almonds are my two favorite nuts with peanuts close behind. I think homemade Christmas cards are lovely, but I don’t have the time nor skill to create them. I don’t even send out regular cards anymore. Christmas was getting too stressful with all there is to do so something had to go. It was a big stress reliever when I let go of the cards AND the guilt of not sending them. Do try them if you love the nuts, you won’t be disappointed.Yes, you said it right no guilt, glad your holidays are a bit lighter as a result (and greener of course.) Happy New Year! Yes you are right, simple, fun and delicious–have a blast! mmm…cashew and cardamon…both are my favourites. These cookies look scrumptious! Yes, I’m obsessed with cardamom. Enjoy these in the New Year–wishing you a wonderful one! Love your photos and your story. Kourabiethes and melomakarona are Christmas classics!!!! I use to bake with my yiayia too. Zito kourabiethes! I have so many memories of my yiayia because she was so active in our lives. Wishing you smiles upon your reflections of your yiayia. Happy New Year. It looks like you picked up on a few of her amazing treats from the look of your lovely blog. Happy creating in the kitchen.